Duplicate contents are always the big headache for all the writers and Google. Many authors are using the DMCA report to complain someone are copying their results. 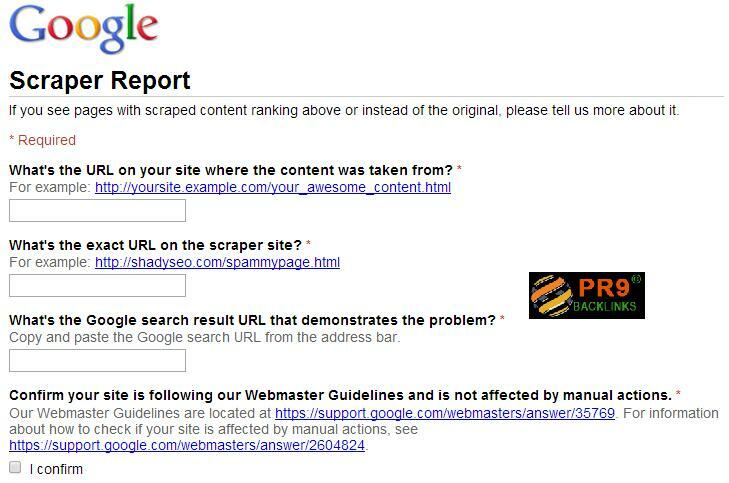 Google launched the Scraper Report on the last month Feb 2014 to let webmaster, authors and the contents contributors to submit the duplicate contents. Using the duplicate contents on the website will be outranked by Google — Said Matt Cutts the head of Google spam team. The form is very simple. All you need is just submit the original URL and duplicate URL. Google will check and do further investigation. Once the duplicate contents are confirm are using the original contents, the website will be punished by Google.